I really wasn’t sure I was going to make this race based on how I had been feeling the last few months. Knowing that I didn’t feel marathon fit but wanted to see some improvement in my illness I decided to commit to the race and take a long leg. The question was; ‘Should we bother to enter a team’. With illness, injury, lack of fitness, and finally the training camp in Portugal reducing the potential team to just seven entries, we did ponder. But, unlike Herne Hill, Thames, Clapham Chasers, Hercules Wimbledon and Ranelagh amongst many other local clubs, we did make the effort and wasn’t it worth it. The question that remained from the Southern’s and something I said to Charlie ( Team Manager) was if you can get a fairly reasonable team and some commitment I will be there! He along with the men’s team manager questioned ‘Should we bother to enter a team’. With illness, injury, lack of fitness, and finally the training camp in Portugal reducing the potential team to just seven entries, They did ponder. But, unlike Herne Hill, Thames, Clapham Chasers, Hercules Wimbledon and Ranelagh amongst many other local clubs, we did make the effort and wasn’t it worth it. This event has its own unique special atmosphere with clubs from all over the country taking part. The brilliant sunny warm weather added to a very special and enjoyable day. 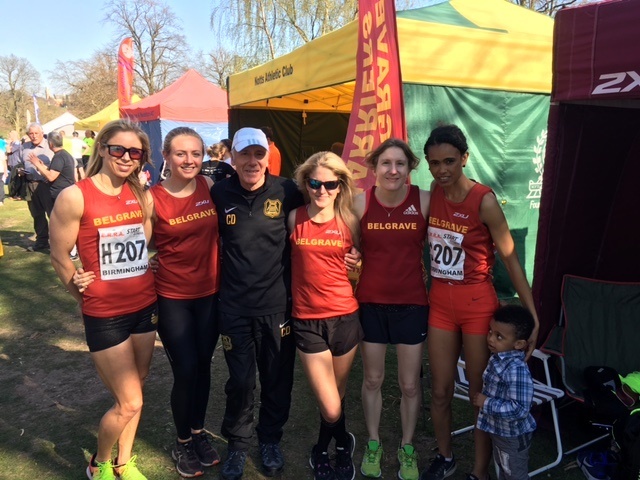 We were hoping for a top twenty finish, we did much better, but most importantly, all six in the team came with a wonderfully positive approach and everyone ran well. Lou my teammate was going to be my backup if I didn’t by close of Wednesday feel well enough but declared myself fit enough three days before. Not quite in the form, I tackled that first long stage which can be carnage with the fast start which I had to back off from and did feel my chest tighten and started to burn in the heat. Common sense paid off and wanted to finish knowing the rest of the team needed me, only down a mere 41 seconds slower than last year in 18th place. So, a very good day enjoyed by all the team and proved it was worth entering a team. We were also fortunate enough to have Bill and Alan the usual Belgrave support and Sophie ( currently on come back) taking some photos.